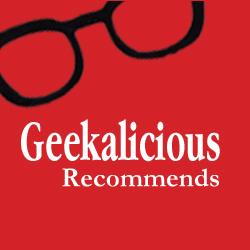 Welcome to another "Geekalicious Recommends..." Here are some geek and tech links that I have enjoyed this month. I cannot express how much I am loving Google Plus at the moment. I have been awarded Google Authorship which means that my content and recommendations are attributed to me. This is important to me as my blogs are not written anonymously and I feel that recognition is important both for content and in Google search. The first two images on this Visualise Google Plus post from GooglePlus Helper are a great starting point to help you decide whether to +1 or share a post you see in your G+ stream. Their Text Formatting Cheat Sheet is also a great resource for newcomers to G+. I really enjoyed this short, but concise post from Clare over at Bad Language. How To Write Your First Post has some great tips that can be applied to all blogging and details some really good methods to follow if you're in a blogging rut. Clare's Google Reader recommendation is a hot tip! There was a fab little tip on the Cybher blog this month which explains how Instagram synchs @usernames with Twitter. This was timely because my my Instagram name and my Twitter name are different. The two accounts were connected and I could push my Instapics to my Twitter account however they weren't connected in the settings. Now I get Instagram mentions on Twitter automatically. I'm hearing a lot about Reddit recently and I am struggling to understand how I can use it effectively. It is considered bad etiquette to recommend your own links however, if your article is recommended on Reddit you will see an increase in traffic. Like Stumbleupon, this traffic is unlikely to be sticky. Socialmouths have published an infographic called Understanding Reddit Once And For All which helps to understand who uses Reddit, explains the etiquette and explains how and where to post content. I loved this post How To Make Every Reader Feel A Part Of Your Community from Quick Blog Tips. It echoes everything I say about community engagement. If you have a comments section on your blog then engage with the people who have taken a few minutes to respond to the post you wrote. And finally, does anyone fancy joining me in a Panoramio Hangout game? It's like a game of hide and seek using Google Maps and Google Hangouts. Give me a shout and I'll set up an event as one of my HOA sessions in the next week or so.